Skirt steak has quickly become our favorite meat to grill. It is inexpensive, quick and easy to cook, and it tastes incredible. 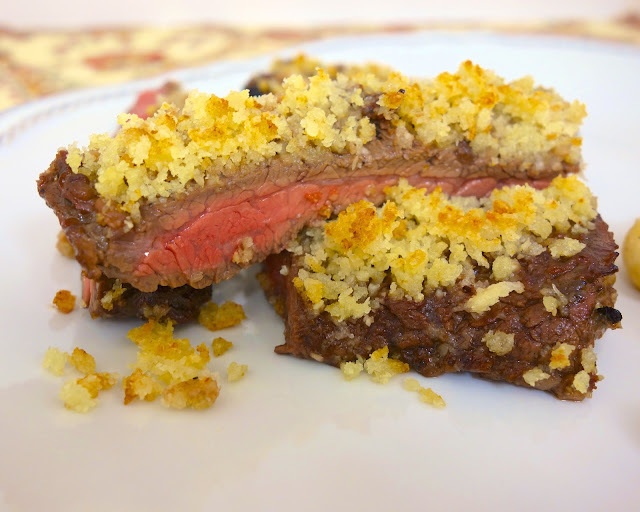 We have been seeing a lot of commercials for Parmesan Crusted Steak at various restaurants. We decided to create our own version with skirt steak. We marinated the skirt steak in a garlic ranch mixture and grilled it. Once it was done (about 9 minutes), we put the Parmesan crust on it and slapped it under the broiler for a few minutes to crisp up. The result was an amazing dinner! 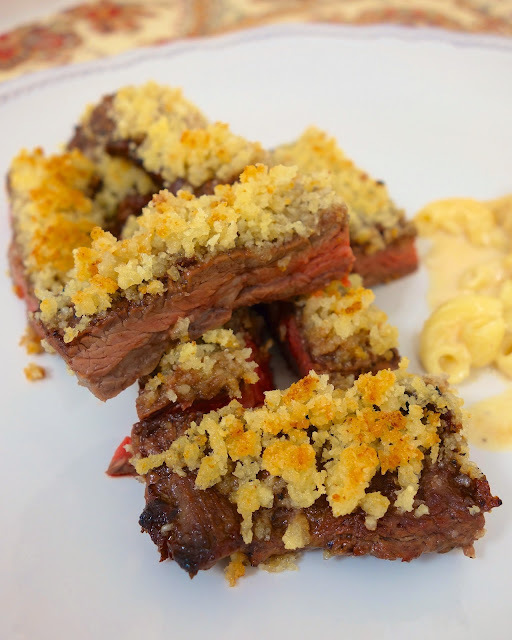 The steak was super tender and juicy, and we both loved the addition of the Parmesan crust. I can hardly wait to make this again! Combine ingredients for marinade and pour over steak. Let marinate in refrigerator for 2-3 hours or overnight. Grill 8-12 minutes, until steak is cooked to desired temperature. While the steak is cooking, mix together bread crumbs, garlic salt, shredded Parmesan and butter. Transfer cooked steak to oven-safe casserole dish. Top with Parmesan crumb topping. Place steak under broiler and cook until cheese melts and crumb topping begins to turn light brown. Serve immediately. I haven't seen this before. I love skirt steak too. This sounds yummy! AWESOME! I absolutely LOVE this website. The best recipes I have made yet off the internet and my whole family loves them. Thank you!